"Staff were great polite staff." Have a question for @ White Patong Hotel? "The rooms were spacious and came equipped with mini bar (with complimentary water, replaced daily), desk and flatscreen tv." "It was a good moment staying at the hotel." "Cheap and clean staff were always helpful to me." 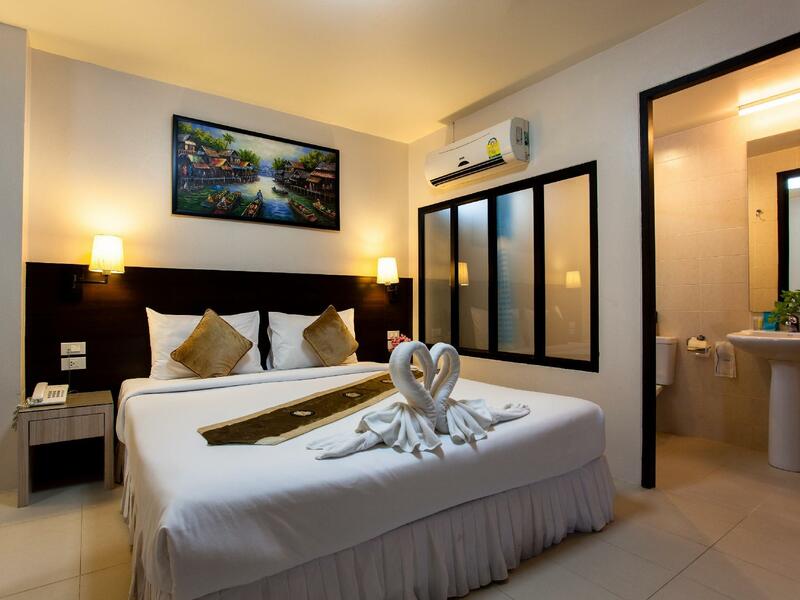 For travelers who want to take in the sights and sounds of Phuket, @ White Patong Hotel is the perfect choice. The hotel is not too far from the city center: just 15 km away, and it normally takes about 45 minutes to reach the airport. A haven of rest and relaxation, the hotel will offer total renewal just steps away from the city's numerous attractions such as Jungcelon Shopping Mall, Bangla Boxing Stadium, Bangla Mall. At @ White Patong Hotel, every effort is made to make guests feel comfortable. To do so, the hotel provides the best in services and amenities. The hotel offers access to a vast array of services, including free Wi-Fi in all rooms, 24-hour front desk, Wi-Fi in public areas, room service, airport transfer. The hotel features 44 beautifully appointed guest rooms, many of which include internet access – wireless, internet access – wireless (complimentary), air conditioning, wake-up service, desk. The complete list of recreational facilities is available at the hotel, including spa, massage. 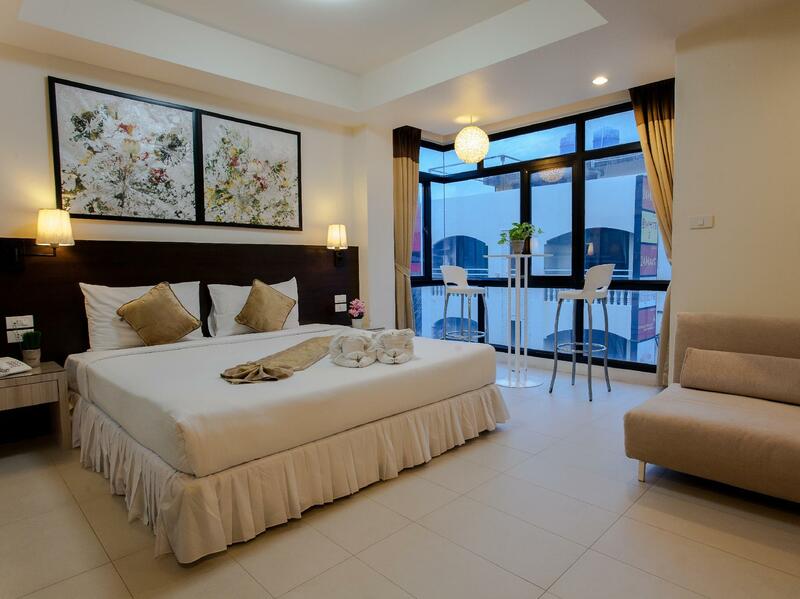 @ White Patong Hotel is your one-stop destination for quality hotel accommodations in Phuket. "the location is good for walk to the beach or the market." All guests will get a special discount of 15% on all massage services at Sansabai. Accommodation in a direct center with adequate money. A super credit card option without any additional "fines" that are commonly accepted in Thailand by traders for that matter. A little noisy until morning, you hear all English hooligans on the street. When you get tired, you can accept it. There is no elevator if you want to live with a big trunk on 3 floors and you have to go through a narrow and steep staircase. In a good place to access most places. The only problem was wifi only lasted a day had to pop to reception to get daily acess. Great location to the beach, bangla rd, street food, Or you can just dine downstairs while watching the world go by. The only drawback is there is no lift to the higher room, stairs only. This property has no pool also. Very noisy and old tvs with poor reception. nice room.. close to bangla road hence little noisy. No lift and my room was on 5th floor. Staff has no concern as no body even bother to Welcome you or show you your room... However it was budget friendly. Overall good, the only downside is that there is no elevator, the sound insulation effect is a bit worse because the nearby bar sound is too big, the food is delicious and not expensive, the waiter is also very good, and the hotel price is very cheap. Good location, very convenient. But room dusty, air-cond no cold, no hair dryer. Phone at the room for display only, can't make call. Staff not friendly, bad service. Really can't expect too much with this price. Quality is same with the price. Near to the mall, Bangla road is just across the road. The beach is 5minutes walk! Motorbike rental is available infront of this hotel, spa and halal restaurant around the corner! What more could you ask for. Our room at 5th floor, so no nosiy sound even at 1-5am, had no issue to sleep. One downside, this hotel have no lift, so work your a** up climbing to your room! 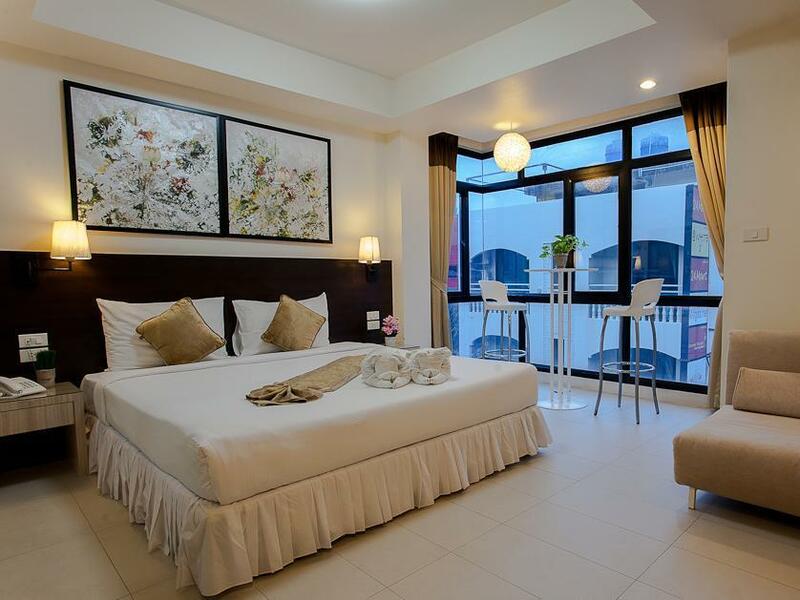 Other than that, go for this hotel for great stay at Patong! Poor quality bed and all tvs..
We stayed in room 23 & 24 which are very noisy throughout the night till 3am when the music stopped. So, if you are there to party & will not be affected by noisy environment, then these rooms should not be an issue. The aircon in room 24 is far from the bed which make it warm during resting. Stay away from this hotel: - wrong room pictures - Very rude service As other reviewers also mentioned: the rooms are very different from the pictures. Standard room: No balcony, only two super small windows. It’s a jail like feeling. The pictures on Agoda show a big window with a balcony. I was asked to pay 1000 BHT a night to upgrade the room. The older receptionist lady which claimed that the wrong pictures are not her fault - „it’s the owners fault“ - was very rude to me at all times. She even made rude sounds when I walked by the reception and shouted „NOOO“ when I asked to change the time of my airport taxi. I was always friendly, smiling and respectful at all times to her. I never requested but only nicely asked her. Therefore, I did not deserve this kind of treatment. Stay away. This is a nightmare and to the owner: think about who you put as your receptionist in charge as the current one is the worst possible face for your hotel. And, add correct pictures to your room definitions as you’re knowingly deceiving customers. I hope your hotel will be unlisted from Agoda to save other customers vacation. Had a great and enjoyed days in this hotel. The room is clean and taken cared by outstanding staff. Excellent location for night party, massage, food and shopping. I will stay here again on my next trip. The rooms were always cleaned to a high standard. The rooms were spacious and came equipped with mini bar (with complimentary water, replaced daily), desk and flatscreen tv. They were spacious and serviced by the hotels adequate wireless - which was superior to that of many other hotels in the area. I really like this little hotel. Super location if you want to party all night on Bangla Road or walk to the Patong beach. No elevator. My room was on third floor and the music was loud all night. I bring ear mufflers so no problem for me. Room has good A/C, good hot water with good pressure at all times. Room has a safe. No problems. They give you damaged items later on claim exburent charges. They talk polite while check in later their behavior is most cunning ,rude. Never, never, never ever go there again. Why such hotels are listed in reputed sites. I would mail a complaint to tourism department/ ministry of Thailand. Well I have not occurred a financial Loss, but they tried to cheat me. Thailand is on tourist financial support, I think the country should not loose it's incomes due these type of hotels. I don't want to give any rating rather I should give them zero. Please be warned. The location very near to Bangla road. Luckily my room at level 4 and you can sleep well. Good for staying, superb Wifi access and great location. First day sleep at the room and bite by bedbugs!!! Me and my sister whole body, hand, and face itchy and swelling!!! It’s terrible!!! Great location. Very close to where all the entertainment is. Room was decent size and had the basic essentials but was clean. Area can be noisy at night but it’s part of staying close to Patong area. Would definitely stay here again.